Today we decided to visit our new Sudanese friend Namad, who we met while on a random stroll a couple of weeks ago. We had Namad’s address, so we decided to drive to her house and see if she was home. She was home, and we met her cousin Santino and her children — 4 year old twins — Nazik and Nazar. The kids were in the middle of eating (brunch, perhaps? ), and so of course we were offered the food as well. 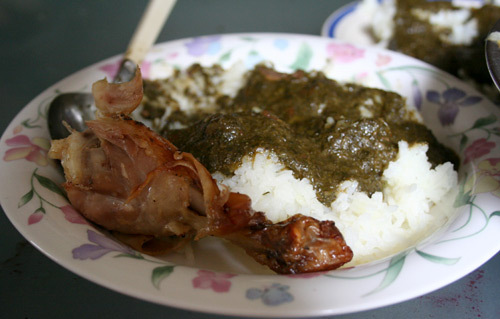 Namad had made a fantastic spinach and okra sauce. Eating it transported me back to West Africa, and I eagerly finished the whole meal. We sat around the coffee table in the living room while we ate. This is a very African way of eating with company. It leads to a more companionable way of conversing over the meal instead of sitting formally upright at a dining table. 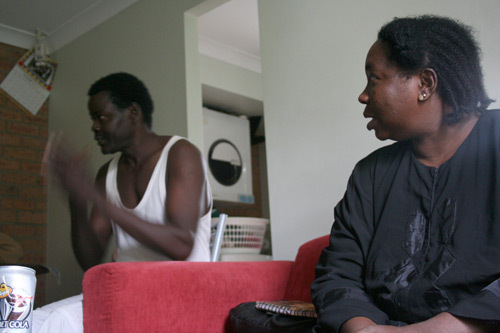 As we sat in their living room, we got to hear more about their lives before they came to Australia. 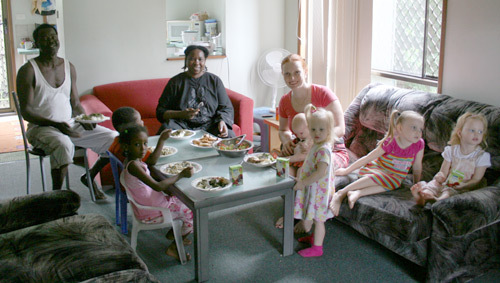 Namad’s and Santino’s mothers are sisters, and Namad shared a house with Santino’s wife in Egypt. Before he came to Australia with a help of a cousin in Sydney, Santino lived and worked in Lebanon, where he learned his rudimentary English. Twelve years ago, Santino left Sudan via Egypt, flew to Syria and then paid US$200 to be smuggled into Lebanon. In the manner of other Sudanese we have known, Santino worked hard, saved his money up and brought his wife and three children over here. They have since split up, and he doesn’t see his children any more. 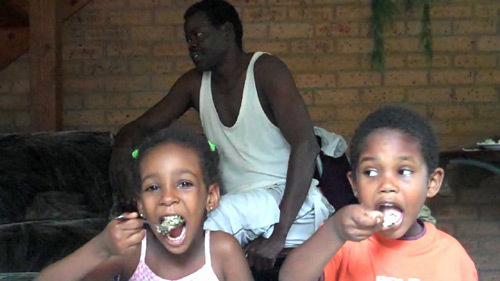 Now Namad and her two children share his two-bedroom unit. Namad would talk to us in Arabic, and Santino would interpret into English. It took a while for our girls to warm up, but soon they were racing up and down the stairs with the 4yo twins. When it was on, however, the TV provided too much of a distraction. 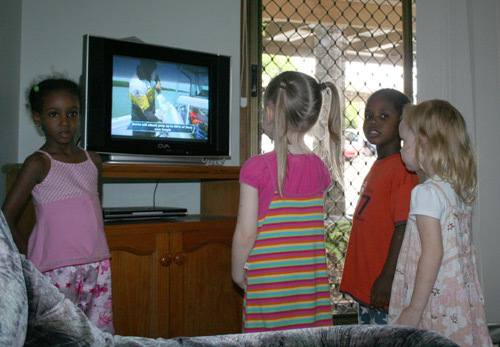 As long as the television was on, our girls couldn't take their eyes off it. After leaving their house, David and I reflected on the difference of expectations between us (who are accustomed to relative wealth and comfort) and the Sudanese who have lost everything through conflicts. Earlier this morning, we escorted a family around our house. After the grand tour, they dismissed the house as not-big-enough. As a family of six, they wanted six bedrooms and our house doesn’t quite fit the bill. However, Namad and Santino live happily in a two-bedroom unit with two boisterous pre-schoolers. Previously... The end of cute? While our house was being built Brett,the Triplets and myself lived down stairs in one room at Bretts parents house..This was a challenge as I had no room to catch any space for myself at all and brett would be gone for days with his job….Funny though the first night we moved into our new house and all had our own bedrooms again the triplets ended up in our bed as we were all used to being so close and together – now we have a king size bed !!!! I do think that the smaller the house the closer the family will be.